Would you prefer to sit inside or outside? Nestled between the lower terrace and the upper terrace, the Spritz bar is the perfect place to unwind. Using produce from Pocket City Farms & local spirit, beer and wine suppliers, our Spritz bar offers a range of colorful & interesting drinks. The Spritz bar is covered in lush, hanging herbs & flowers which are used in our spritzes. The ‘foraging bartenders’ pick the produce straight from the planters, while making the spritzes, and use them as garnish. The bar menu is Mediterranean inspired, with an outdoor wood fire oven to bring earth flavors to our mains. Please note that we are fully licensed and not BYO. You’ll find our Garden Terraces along the deep, wooden deck outside of the main restaurant. Sheltered and abounding with hand-carved tables and plenty of seating, the deck wraps around a roomy lawn complete with oversized umbrellas and rugs to lounge on. Uniquely spacious for an inner-city setting, the Garden Terrace is a casual and homely place to nourish yourself, friends and family with garden-fresh food and beverages. Sit back with a locally sourced coffee, a pot of nourishing tea, a fresh juice, our legendary bloody mary, a hand-crafted beer or cider, a refreshing glass of wine (from a bottle or on tap), or a mouth-watering cocktail, and soak up the farmhouse vibes. Come along for live acoustic sessions on Sunday from 3pm – 6pm. Our sustainable and seasonal food menu caters to all tastes, with generous amounts of flavour on every plate, including Pocket City Farm herbs and farm-fresh produce. There’s a special weekend menu with plenty of breakfast options (served between 8am – 11.30am), a kid’s menu to keep the young ones nourished on the go, and delectable desserts available from noon. Kids have loads of room to play on the grass or curl up with a story from our mini bookshelves. A specially designed, hands-on kids play area takes up a corner of the property, allowing little ones to amuse themselves and each other for hours. The unique Common Spaces provide inspirational environments to hold group workshops, meetings and events. 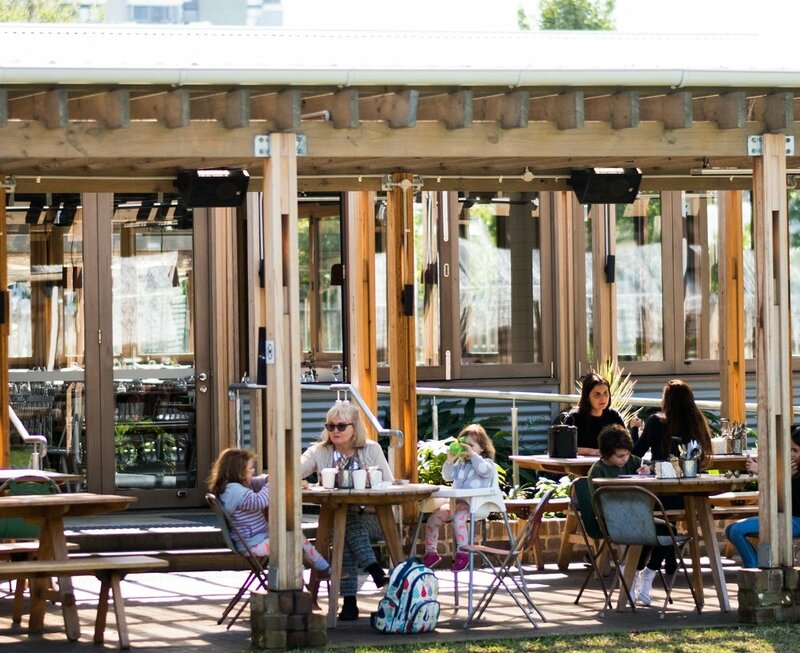 In line with their vision to provide a lively hub where locals can connect, learn, relax and belong, Camperdown Commons provides much-needed spaces for hire for the community in an inspiring environment. You can book these spaces by contacting Camperdown Commons, here. The Common Room is a great indoor/outdoor space, with an adjacent 60sqm covered deck area easily accessed through large bi-fold doors, which looks over the sunny paved courtyard and is suitable for all weather conditions. The Common Pavilion is a large open 112sqm covered deck area, with retractable café blinds that can be used for privacy or to shield from extreme weather conditions. For large events requiring more space both the Common Room and Common Pavilion may be hired together. The paved 130sqm courtyard between the two spaces may also be used as overflow and is included in the cost of hiring both spaces. Catering at events in the Commons Spaces are provided by acre. Spoil someone special to you with the acre gift voucher. Vouchers are valid for 12 months and can be bought here and collected from the restaurant or sent via express post. We are happy to cater to all dietary requirements & food allergies, when notified in a timely matter. However, acre's kitchen is not completely allergy-free. Therefor, the food may contain traces of allergenic substances. Please note all dinner bookings prior to 7.00pm will be for a 2-hour seating. A set menu applies for group bookings of minimum 10 adults and up to 25 guests. Please submit a booking enquiry and our booking team will get back to you shortly. We offer a casual breakfast menu on weekends only in our garden terrace areas. This is mainly a walk-in space. We do take breakfast reservations for groups over 10 guests, for which a set menu applies. Find out about the set menu here. We will contact you 24 hours prior to confirm your booking. If we are unable to reach you, please contact us directly. Our reservations team operate from Monday to Friday business hours. Our team will endeavour to respond to your request within 24hours. If your enquiry is for the same day or you require urgent assistance, please contact our restaurant directly on (02) 9194 3100. Children are very welcome at acre. Please inform us upon booking if you require space for a pram or a high chair. Please note whilst we do provide high chairs, they are limited. Preferred seating is not guaranteed. All allocations are dependent on the date of your reservation and number of guests.